Keep your gadgets fully charged while making trips with Ambrane P-1200 12000 mAh Power Bank. This power bank with 12000 mAh battery enables you to charge your smartphones and other devices even in the absence of an electric socket. Lightweight and compact, this power bank is a perfect travel companion that keeps you connected with the world. 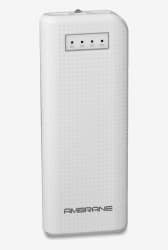 This power bank s rechargeable battery keeps it powered up for all your on-the-go needs.